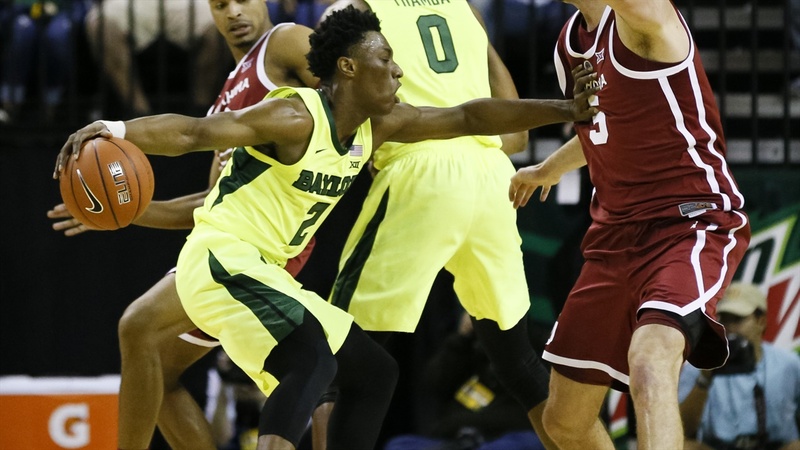 WACO, Texas —The Baylor Bears outlasted the Oklahoma Sooners to sweep the regular season series against the Sooners with a 59-53 win in Waco on Monday night. The victory was Baylor’s first since their victory over TCU on Feb. 2. After a tough loss at home against Kansas State on Saturday without the services of King McClure and Makai Mason to give the Bears two straight losses after winning six straight, it’s safe to say that the Bears needed the win to rejuvenate the mojo. McClure and Mason both were game-time decisions once again, but only Mason was able to go. Despite a tremendous job handling the ball and played great defense, the senior showed his rust after significant missed time to a toe injury as he struggled shooting from the field. Mason shot just 2-14 from the field and was 0-5 from the three point line in the contest and finished the contest with 6 points and a career high 8 assists. With Mason struggling to score, the final outcome was ultimately decided by the incredible shooting of his teammates from the perimeter and the exceptional work on the defensive end that led to the victory. As a team the Bears shot only 39% from the field overall, but connected on a blazing 46% from the three point line as 10 of their’ 21 made field goals came from deep. The Bears were unselfish in their effort, moving the ball around the perimeter exceptionally well throughout the game, finishing with 15 assists to 10 turnovers. Aside from Mason, the Bears shot 48% from the field and an astounding 59% from the three point line. Leading the way for Baylor was Devonte Bandoo. The junior guard had one of his best games as a Baylor Bear coming off the bench and pouring in 19 points and making 5 of his 7 three point attempts. His timely field goals truly helped the team gain and eventually maintain their slim lead for the better part of the game. Freshman Jared Butler added 11 points, 5 assists, and 2 rebounds while converting on 3 of his 6 three point attempts. Mario Kegler was aggressive on the defensive end as always, but also made a great contribution on offense with his 9 points and even added 7 rebounds. The effort was also one of the better defensive performances of the team this season as they held the Sooners to 39% shooting from the field and 19% from the three point line. Baylor, who leads the Big 12 in blocked shots, combined for 5 rejections on the night. The Bears did have a similar issue to the previous game against Kansas State where they gave up 17 free throw attempts and the Wildcats made 15 of them. The Bears gave up 15 free throw attempts but the Sooners connected on just 53%. With the win the Bears are sitting tied for third place in the Big 12 at 7-4 with Iowa State and Texas Tech. Kansas propelled themselves to 8-4 and back into second place with their road win against TCU while Kansas State remains on top with an 8-2 record. The Bears return to action at 1 p.m. CT on Saturday in Lubbock against Texas Tech in another pivotal game in regards to the Big 12 standings. The Bears defeated Texas Tech in Waco on Jan. 19, 73-62.